During the CommunicationBreak on May 19 in Utrecht, the Netherlands, Petra de Boer offers a workshop on Communication Scrum. Scrum is a smart way to organize projects and to quickly achieve visible results. It’s has been used in IT for a long time and is now gaining rapid acceptance in other sectors as well. 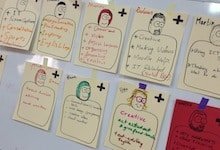 In this workshop you will learn what Scrum communication professional has to offer. Why the detailed long-term plan no longer works and you better focus on the short term. How you can always produce valuable products in short cycles. How you can actively involve your client and other stakeholders during your project. How to respond flexibly to the changing environment. And how you can have more fun working in teams. The workshop is intended for communication managers and executors and offers a mix of theory, practical exercises and industry examples. Petra de Boer is a branding and dialogue coach and partner at Perspectivity. She has over 20 years of experience in corporate communications and participation processes, both for the government and in business environments. She is co-author of “Scrum in action’ a practical Scrum book that will be published mid 2015. Read more about the program and how you can sign up on CommunicatieBreak. The workshop will be conducted in Dutch.